When it comes to the nails, I’m always looking for something new, different and trendy. From clothing to shoes, accessories and makeup, nails are an essential part to completing a beauty look, glamming it up or toning it down. 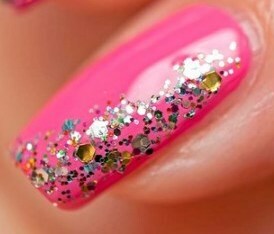 Nail color can really change the look you are trying to portray. A dress can take on a sexier tone when the nails are a bright red instead of a clear polish. Glitter adds some spice and glam, while a fun design shows personality. There were several trends to choose from like 90’s graphics using crazy combinations of designs, with colors, drawings, cartoons, flags. Marble nails and the Negative space are getting more popular with each season. 3D Nail art like adding fur to the nails, strange eye cutouts and anything funky you can think of. Dual toned manicures use have a futuristic metallic appeal with chrome based nails topped with bronzed golden half-moons. Beauty trends are moving towards some really dark hues for the lips and gothic inspired nails. Black polish, dark greys, deep dark purples and a hint of black. Black nail polish is also often used as base; add a taupe or deep plum color over black to spice things up. Matching nails and lips will also be a big trend for fall, using colors like eggplant, graphite and black on both lips and nails. Dark nails can also have a gradient effect, brown to black creations and using crystals and pearls on the nails with a matte black background. It was huge for spring and it certainly makes one of the best fall/ winter nail trends. Nails with a chrome base and a gold half-moon at the cuticle look amazing. Shining, metallic dark silver embellishments give a touch of rebellion to a down-to-earth design. Adding crystals to the nails gives a look of luxury. 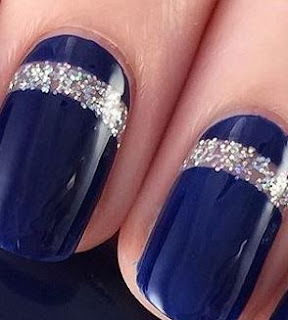 Simple manicures with gorgeous crystal additions result in some amazing looking nails. This is certainly a trend to try out and to show off! For all of 2016, shimmers and glitter are everywhere, from the shoes to handbags, clothing and nails. Some of the glittery fall trends we’ll see are French manicures with the glittering golden tips. Glittery Hot pink polish, dark glitter with a silver base, golden stars with negative space or add glitter near the cuticles, extending the look of the nails. Lines are simple but can have major effect. 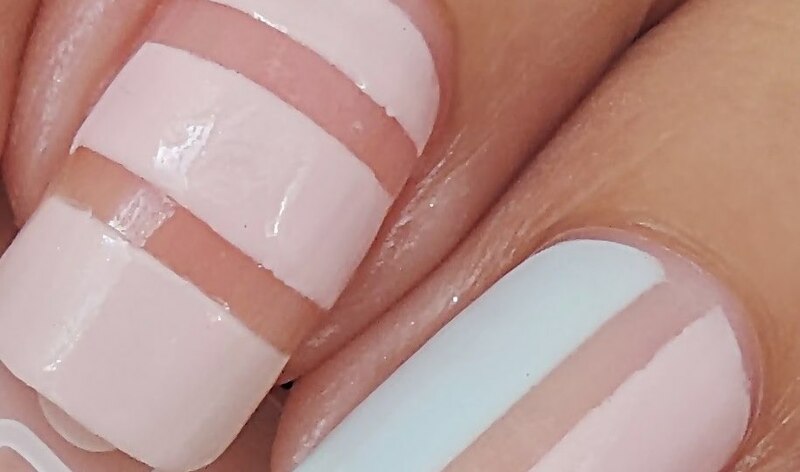 Nails can have a clear background and line down the center of the nail or a single line of gold over matte taupe nails creating sophistication. 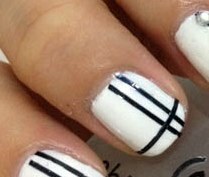 Lines are added in negative space designs as well, horizontal stripes in black over clear nails. Minimal effort and maximum appeal! Simple nail looks work well when they appear trending and stylish and not just plain. Try lighter browns, nearly clear polish, classic pink or natural earthy colors in a matte finish for a simple yet lovely look. Simple can be colorful too, when you want to brighten up your monotonous looks add a splash of bright color. Which of these fall/ winter 2016 nail art and nail polish trends fits your style? To read my blog post on Fall Hair Trends, Click HERE and for Fall Makeup Trends, read HERE!